"Jesus Christ did not come down from Heaven like a hero that comes to save us. No, Jesus Christ has a history!" "It’s not being a religious fraud or something of that sort…No!" "These doctors of the law that the people…yes, they heard, they respected, but they didn’t feel that they had authority over them; these had a psychology of princes!" "[Saying] ‘We are the masters, the princes, and we teach you. Not service: we command, you obey.’ And Jesus never passed Himself off like a prince: He was always the servant of all, and this is what gave Him authority!" "[They despised] “the poor people, the ignorant,” they liked to walk about the piazzas, in nice clothing!" "They were detached from the people, they were not close [to them]; Jesus was very close to the people, and this gave authority!" "These doctors, had a clericalist psychology!" "They taught with a clericalist authority – that’s clericalism!" "That’s where you find the authority of the Pope, closeness. First, a servant, of service, of humility: the head is the one who serves, who turns everything upside down, like an iceberg." "They said one thing and did another. Incoherence. They were incoherent. And the attitude Jesus uses of them so often is hypocritical!" "And it is understood that one who considers himself a prince, who has a clericalist attitude, who is a hypocrite, doesn’t have authority! He speaks the truth, but without authority!" "Open to the Lord, not closed, not hard, not hardened, not without faith, not perverted, not deceived by sin!" "The Lord has met so many of these, who had closed their hearts: the doctors of the law, all these people who persecuted him, put him to the test to convict him!" “Those who didn’t move…and watched. They were sitting down…watching from the balcony. Their life was not a journey: their life was a balcony!" "From [their balconies] they never took risks. They just judged. They were pure and wouldn’t get involved. But their judgements were severe!" "In their hearts they said: What ignorant people! What superstitious people! How often, when we see the piety of simple people, are we too subject to that clericalism that hurts the Church so much!" "Am I watching life with a soul that is static, with a soul that is closed with bitterness and lack of hope?" “Lazy Christians, Christians who do not have the will to go forward!" "Christians who don’t fight to make things change, new things, the things that would do good for everyone, if these things would change!" "They are lazy, “parked” Christians: they have found in the Church a good place to park!" "And when I say Christians, I’m talking about laity, priests, bishops…Everyone. But there are parked Christians!" "For them the Church is a parking place that protects life, and they go forward with all the insurance possible!" "No. Hope is struggling, holding onto the rope, in order to arrive there. In the struggle of everyday, hope is a virtue of horizons, not of closure!" “Life does not come to any of us wrapped up like a gift!" "Parked Christians, stationary Christians, are selfish. They look only at themselves, they don’t raise their heads to look at Him!" “A Christian life without temptations is not Christian, he said: it is ideological, it is Gnostic, but it is not Christian!" "Theirs was an egotistical mindset, focused on themselves: their hearts constantly condemned [others]!" "Doing the Lord’s will, but only superficially, like the doctors of the law that Jesus condemned because they were pretending!" "When one goes along the street and an unexpected rain comes, and the garment is not so good and the fabric shrinks!" "Confined souls! This is faintheartedness: this is the sin against memory, courage, patience, and hope!" "Afraid of everything… Confined souls in order to save ourselves!" "The fainthearted are those “who always go backward, who guard themselves too much, who are afraid of everything!" ‘Not taking risks, please, no… prudence…’ All the commandments, all of them… Yes, it’s true, but this paralyzes you too, it makes you forget so many graces received, it takes away memory, it takes away hope, because it doesn’t allow you to go forward!" "Statisticians might have been inclined to publish: ‘Rabbi Jesus’ popularity is falling’. But he sought something else: he sought people! And the people sought him!" "[The survival mentality] makes us look back, to the glory days – days that are past – and rather than rekindling the prophetic creativity born of our founders’ dreams, it looks for shortcuts in order to evade the challenges knocking on our doors today!" "[The survial mentality] makes us want to protect spaces, buildings and structures, rather than to encourage new initiatives. The temptation of survival makes us forget grace!" "A survival mentality robs our charisms of power, because it leads us to “domesticate” them, to make them “user-friendly”, robbing them of their original creative force!" "The temptation of survival: An evil that can gradually take root within us and within our communities!" "[The survival mentality] turns us into professionals of the sacred but not fathers and mothers, brothers and sisters of that hope to which we are called to bear prophetic witness!" "The mentality of survival makes us reactionaries, fearful, slowly and silently shutting ourselves up in our houses and in our own preconceived notions!" "An environment of survival withers the hearts of our elderly, taking away their ability to dream!" "[An environment of survival cripples the prophecy that our young are called to proclaim and work to achieve!" "The temptation of survival turns what the Lord presents as an opportunity for mission into something dangerous, threatening, potentially disastrous. This attitude is not limited to the consecrated life, but we in particular are urged not to fall into it!" "To put ourselves with Jesus in the midst of his people! Not as religious “activists”!" "Because they could not receive the things of God as a gift! Only as Justice: ‘These are the Commandments: but they are few, let’s make more! ""And instead of opening their heart to the gift, they hid, have sought refuge in the rigidity of the Commandments, which they had multiplied up to 500 or more!" And not the closed, sad prayer of the person who never knew how to receive a gift because he is afraid of freedom that always carries with it a gift. "The rigidity of the closed Commandments, that are more and more “safe” – with emphasis on the scare-quotes! – but that do not give joy, because they do not make you free!" "No, no, no! The woman is there to bring harmony. Without the woman there is no harmony. They are not equal; one is not superior to the other: no. It’s just that the man does not bring harmony! "No, no, no, no! Functionality is not the purpose of women!" “There are so many corrupt people, corrupt ‘big fish’ in the world, whose lives we read about in the papers. Perhaps they began with a small thing, I don’t know, maybe not adjusting the scales well!" “Even within our episcopal colleagues there are small cracks and rifts that can lead to the destruction of brotherhood!" “The Word of God cannot be given as a proposal – ‘well, if you like it…’ – or like good philosophical or moral idea – ‘well, you can live this way…’No!" "No, you will say, yes, something interesting, something moral, something that will do you good, a good philanthropy, but this is not the Word of God!" "‘I am very Catholic, I always go to Mass, I belong to this association and that one; but my life is not Christian, I don’t pay my workers a just wage, I exploit people, I am dirty in my business, I launder money…’ A double life!" "And so many Christians are like this, and these people scandalize others. How many times have we heard – all of us, around the neighbourhood and elsewhere – ‘but to be a Catholic like that, it’s better to be an atheist!’"
"But you will arrive in heaven and you will knock at the gate: ‘Here I am, Lord!’ – ‘But don’t you remember? I went to Church, I was close to you, I belong to this association, I did this… Don’t you remember all the offerings I made?’ ‘Yes, I remember. The offerings, I remember them: All dirty. All stolen from the poor. I don’t know you.’ That will be Jesus’ response to these scandalous people who live a double life!" "Because they thought of the faith only in terms of ‘Yes, you can,” or “No, you can’t” – to the limits of what you can do, the limits of what you can’t do. That logic of casuistry!" "Even with the fourth commandment these people refused to assist their parents with the excuse that they had given a good offering to the Church. Hypocrites. Casuistry is hypocritical. It is a hypocritical thought." "‘Yes, you can; no, you can’t’… which then becomes more subtle, more diabolical: But what is the limit for those who can? But from here to here I can’t. It is the deception of casuistry!" “But what is more important in God? Justice or mercy?’ This, too, is a sick thought, that seeks to go out… What is more important?" "Scandal is saying one thing and doing another; it is a double life, a double life. A totally double life!" "No to the toxic pollution of empty and meaningless words!" "No to the toxic pollution of empty and meaningless words, of harsh and hasty criticism, of simplistic analyses that fail to grasp the complexity of problems, especially the problems of those who suffer the most!" "No to the asphyxia born of relationships that exclude, that try to find God while avoiding the wounds of Christ present in the wounds of his brothers and sisters!" "No to all those forms of spirituality that reduce the faith to a ghetto culture! A culture of exclusion!" “On the other hand there is a fasting that is ‘hypocritical’ – it’s the word that Jesus uses so often – a fast that makes you see yourself as just, or makes you feel just, but in the meantime I have practiced iniquities, I am not just, I exploit the people!" "We take from our penances, from our acts of prayer, of fasting, of almsgiving…we take a bribe: the bribe of vanity, the bribe of being seen. And that is not authentic, that is hypocrisy!" 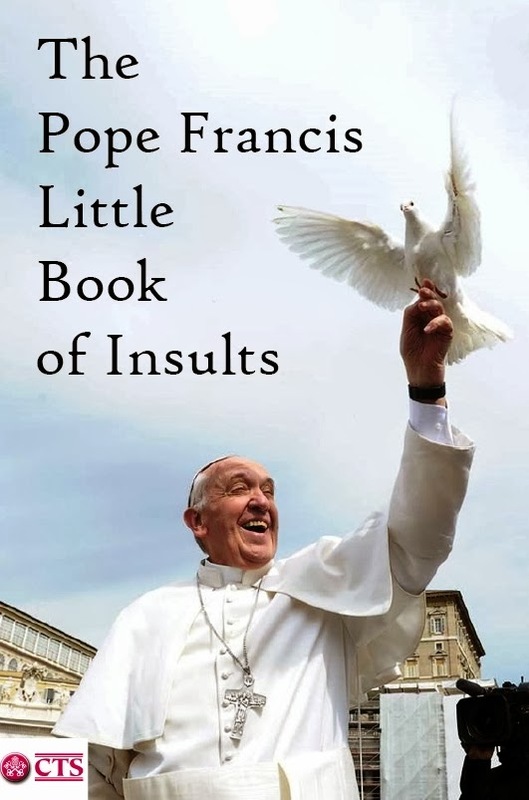 Ongoing catalogue of insults can be read here. Here is an interesting article on the "achievements" of Pope Francis. It's quite revealing of the mind of "progressive" Catholics. The wheels are coming off the FrancisChurchWagon! Pope Francis is so negative and exhausting for the Church. It's time for another conclave subito! He is not very intelligent is he?Some of the above sayings are like the insane ramblings of a madman.May 2017 bring us Blessings to allay this madness.